Annan Athletic completed a double over the Shire in a remarkable match which produced seven goals at a windswept Galabank. It was however a match that must have left the Annan fans totally exhausted as they witnessed their side romp to a 4-1 lead with only six minutes left, but in an astonishing late recovery the visitors had pulled it back to 4-3 with 3 minutes left to play and for the final minutes Annan were holding on for grim death to lift all the points and a victory which sees Annan climb up to the top half of the table for the first time this season. Annan playing with the strong wind in their favour got off to a glorious start when they went ahead in the second minute. Once again it was the reliable Peter Weatherson who notched his fifth goal when he connected with Scott McColm’s low cross from the edge of the 6 yard box . It was a dream start for Annan who have been consistently slow starters, but when David Hopkirk’s high hopeful ball swung in from the right was fumbled by Keeper Richard Barnard with the ball squirming out if his grasp and agonisingly over the line, Annan were in dream land. They were in a situation they had never encountered this season, a 2 goal lead with only 18 minutes gone. Could they hold it ? Annan’s 2 goal lead lasted exactly 6 minutes when Neil McCabe reduced the lea-way to one goal. It was the best goal of the match. The damage was done down the right when David Greenhill somehow managed to get a cross into the centre of the Annan box and from 18 yards Neil McCabe hit a superb shot into the top corner of the net which took a slight deflection to loop over the head of Mitchell leaving the Annan keeper picking the ball out of the net. Hopkirk had the ball in the net in the 26th minute only for the goal to be chalked offside and then moments later Annan had a let off when Watson’s slip let in Andrew Kay but the shot never hit the target. Weatherson was presented with an opportunity in the 30th minute when his 25 yard free kick was deflected for a corner. It was Weatherson however who made amends 2 minutes later when he increased Annan’s lead connecting with Stuart McColm’s corner to head the ball goal ward with the ball squeezing over the goal line to regain Annan’s 2 goal advantage and give Annan a 3-1 interval lead. Annan made a promising start to the second half with Flynn and Hopkirk testing Barnard but playing with the strong wind in their favour the Shire were soon testing the Annan defence. Steven Brisbane was presented with an opportunity in the 64th minute but the 30 yard fee kick flew past the upright. Annan’s David Hopkirk, who has struggled at times this season, for once was a constant aggravation to the Shire defence and in the 68th minute he skipped past Gilmour finishing with a low shot which flashed across the face of the Shire goal. With 76 minutes on the clock Annan struck again with Weatherson slipping the ball into the path of Hopkirk who picked out Flynn and with a lot to do Flynn pulled the ball back and finished with a fine shot he calmly finished to give Annan a 4-1 advantage. Substitute Josh Todd was introduced immediately at the expense of Stuart McColm. Annan pushed forward but it was the visitors who struck gold in the 84th minute when David McKenna started the comeback prodding the ball over the goal line from 4 yards. Weatherson was immediately replaced by Scott Davidson in the 85th minute but 2 minutes later and Annan conceded another goal when substitute Paul Brennan put the finishing touch striking the ball into the net from close range. Annan’s 4-1 advantage was now down to one goal and with over 3 minutes left it was the visitors who were asking all the questions against an Annan defence which looked very vulnerable and uneasy. Annan had keeper Alex Mitchell to thank when he pulled off an important save to deny David Greenhill in the 89th minute. It was the last action in a match which produced plenty of goals, drama and excitement against 2 teams struggling to escape the lower regions of the table. 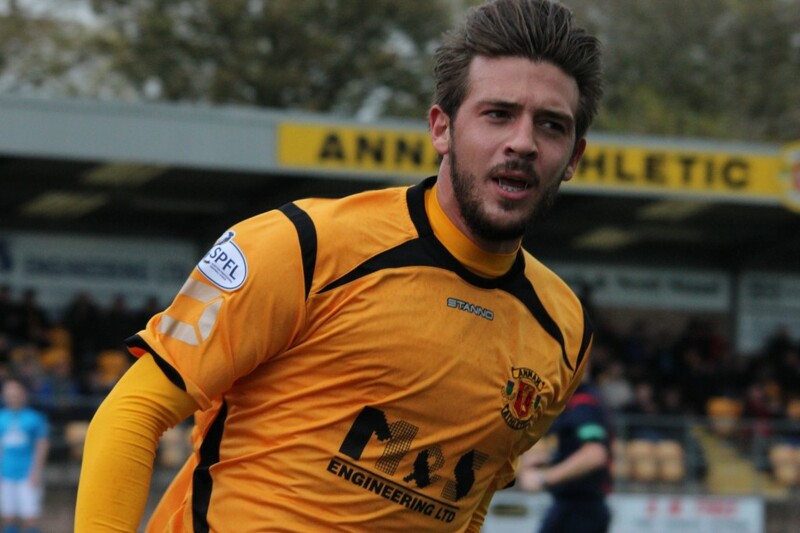 ANNAN ATHLETIC: Alex Mitchell, Steven Black, Iain Chisholm, , Martin McNiff, Peter Watson, Steven Sloan , Matty Flynn, Steven Logan, Peter Weatherson ( S Davidson 84 min), David Hopkirk, Stuart McColm ( J Todd 77 min) . Subs not used Jake Gemmel, GK, Ryan McStay, Keiran Brannan, Robin Omar, Connor Liddell. Assistants: Sean Carr and David Dickinson.